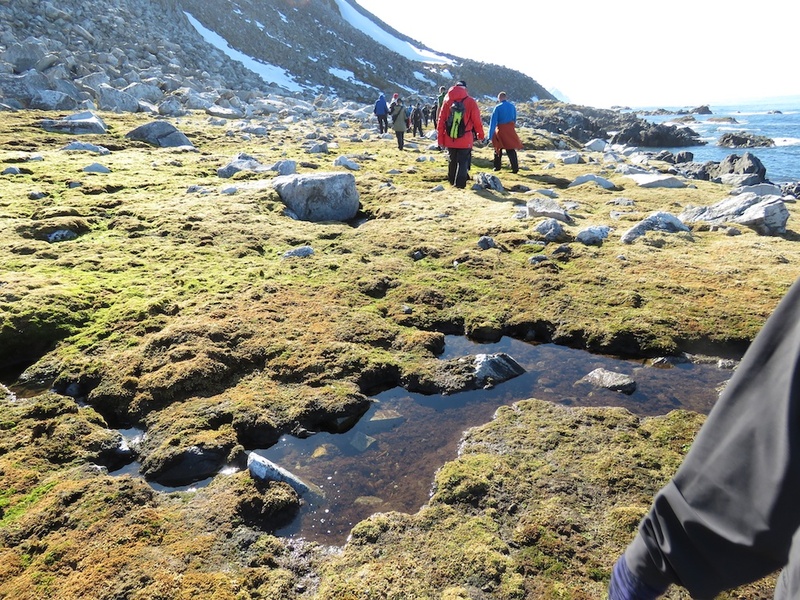 This stretch of tundra is especially green because of a nearby bird nesting colony. Walking on the tundra is an exceptional experience. 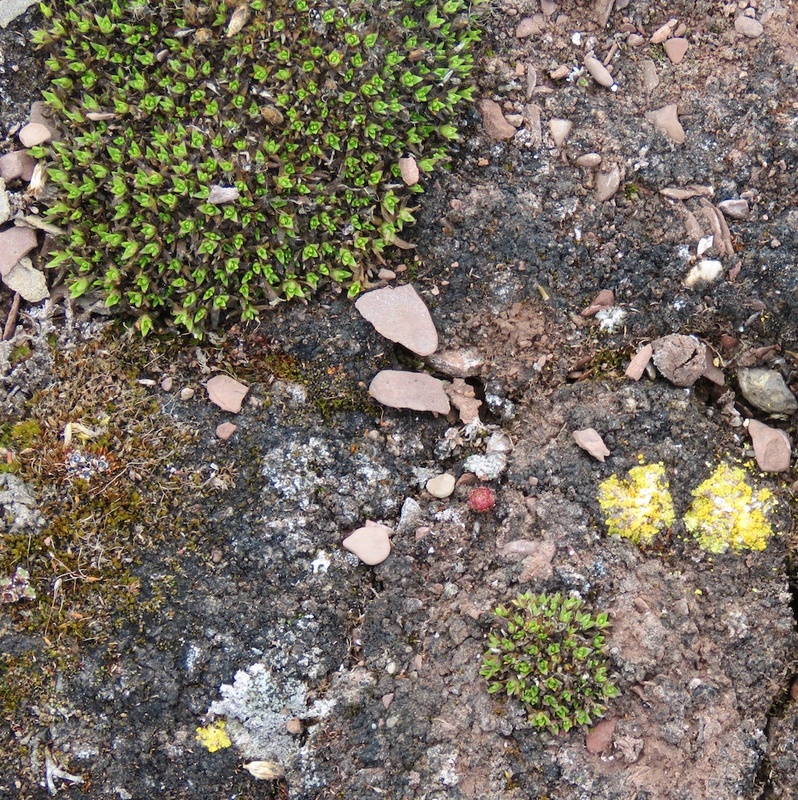 Moss and lichens are very spongy and soft underfoot, with rocks and gravel in between the tufts of low vegetation. We always wore knee-high boots because we never knew when we'd sink up to the ankles or deeper in water, or have to cross a snow-covered area or climb over boulders between open stretches. 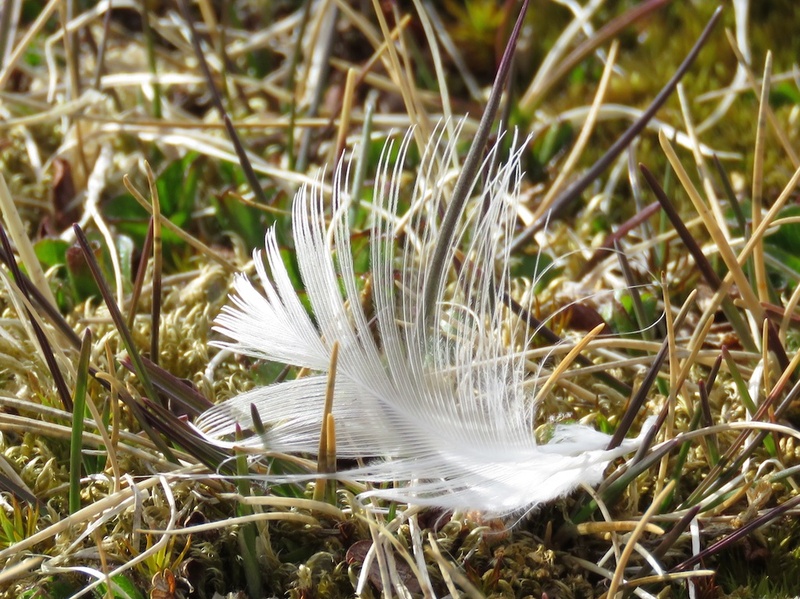 Deeper ponds dot the tundra; these are impassable. 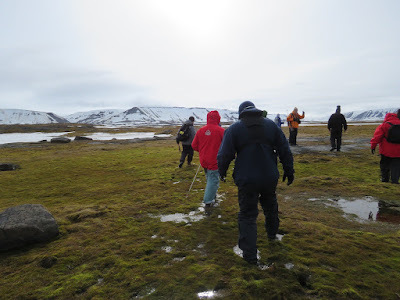 Hiking there can be very challenging! Just a few inches beneath the standing water or water-soaked lichen is hard ice. Unable to soak into the ground, water flows down every slope. 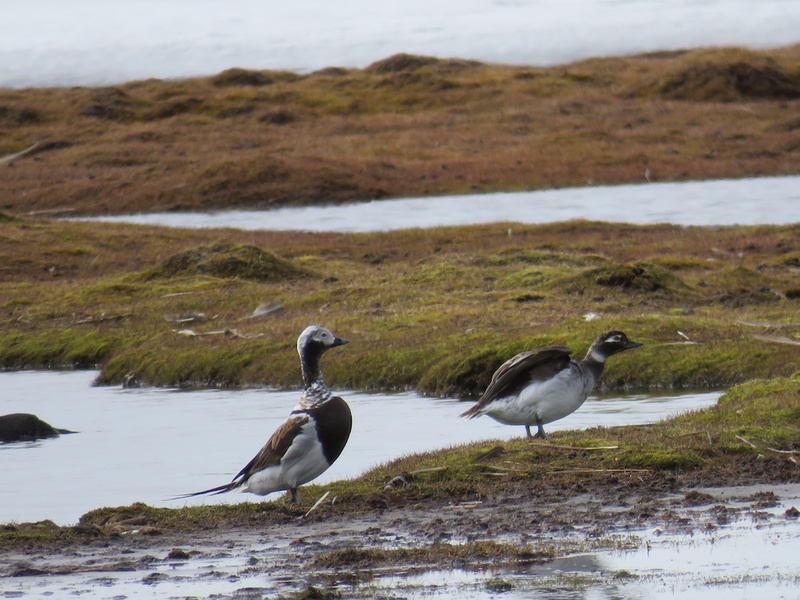 At the shoreline are braided streams and rivulets flowing across rocks, gravel, or sand. On the Svalbard islands, much of the terrain slopes very steeply up mountain peaks, ground down by glaciers in various ice ages. 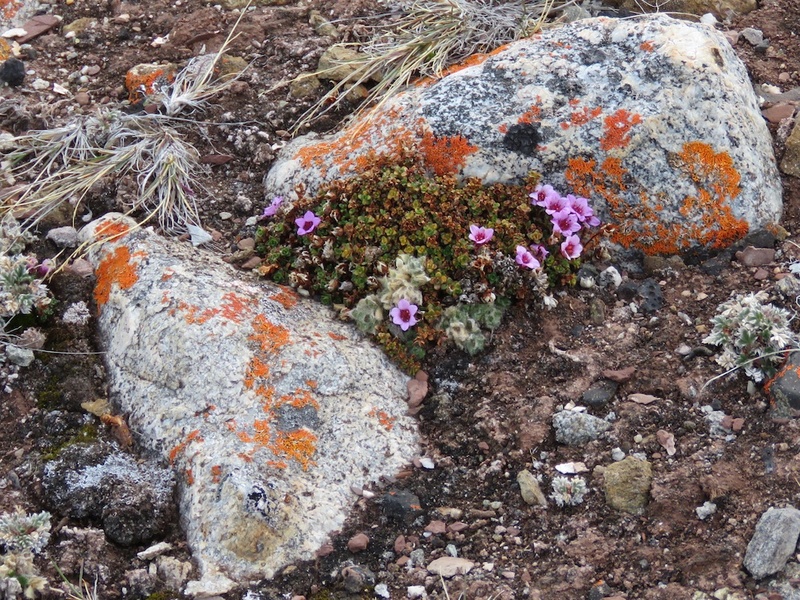 From a distance, everything looks like black rock or brownish grass, usually interspersed with snow. 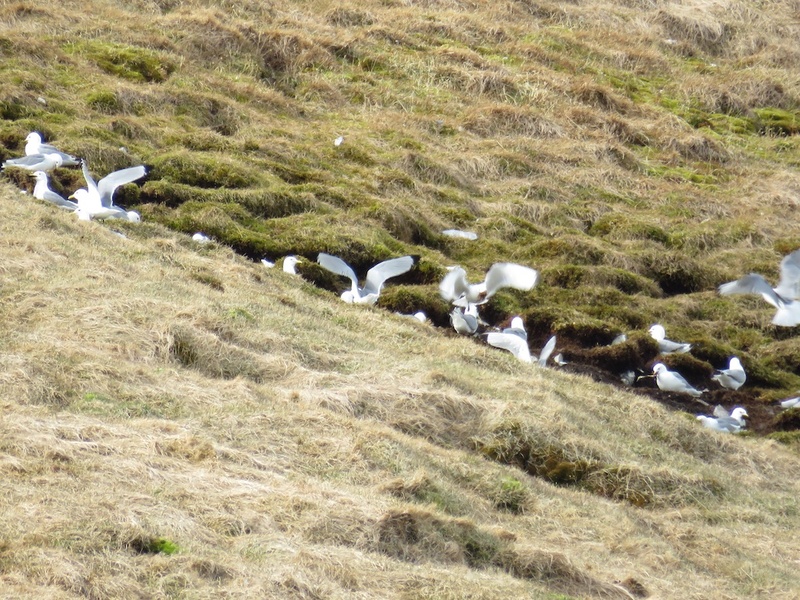 Kittiwakes on a hillside near their nesting colony. 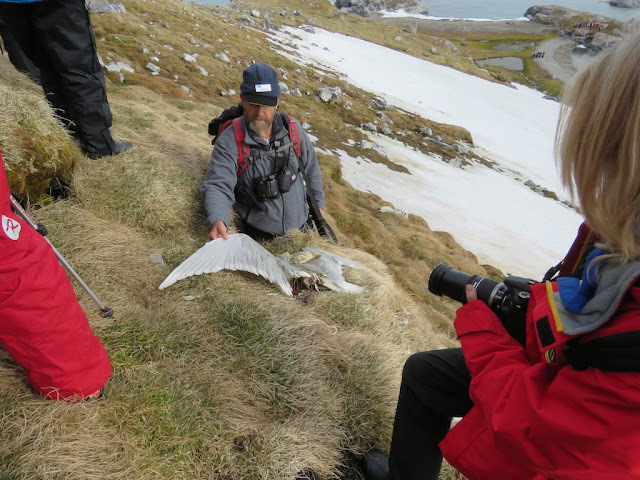 On a steep slope, our guide showed us a dead gull. 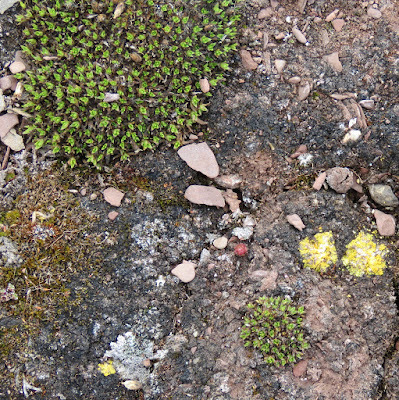 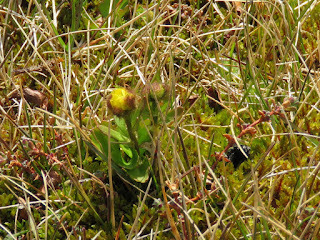 Up closer, moss and lichens are sometimes green or greenish, but sometimes they are white, red-orange, chrome yellow, tannish-yellow, rusty red, or dull brown. 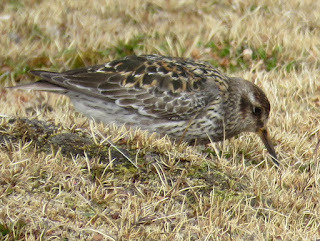 There is little nitrogen in the sparse soil to nourish the vegetation, though run-off from bird nesting colonies creates a richer environment. Cliff-side nesting colonies are occupied by sea-going birds -- kittiwakes, dovekies (aka little awks), guillemots. 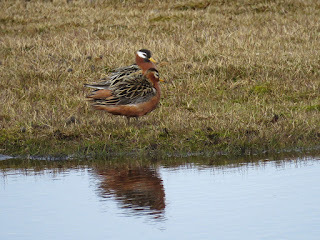 (I will be doing another post on the nesting colonies.) 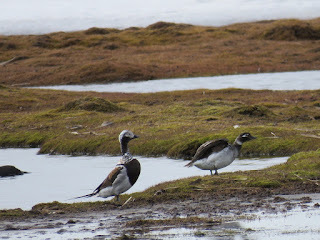 Ducks, geese, and loons swim in the ponds on the tundra or in the sea. 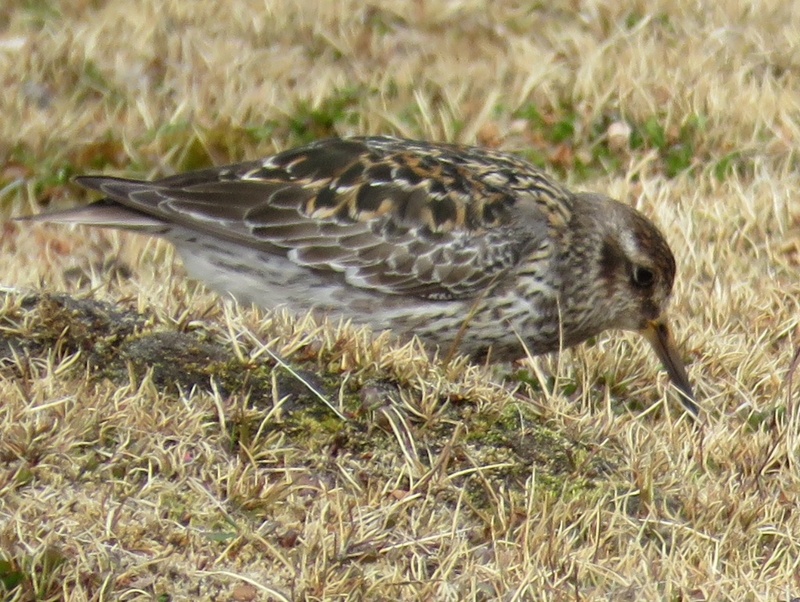 Small wading birds like phalaropes and sandpipers pick at the vegetation. 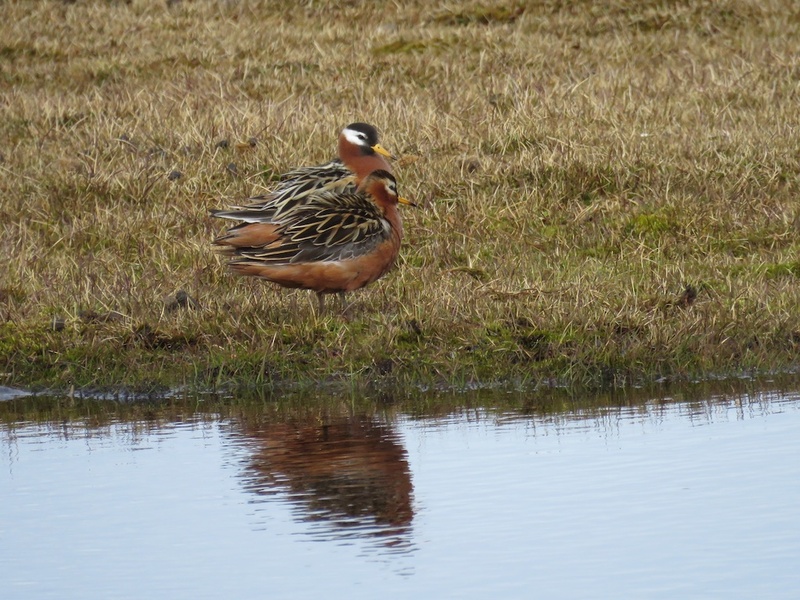 Pair of phalaropes beside standing water on the tundra. 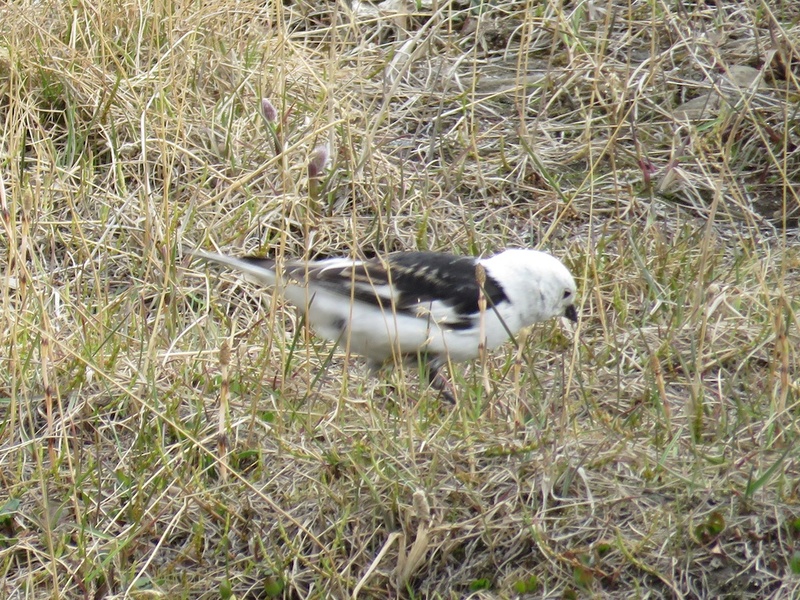 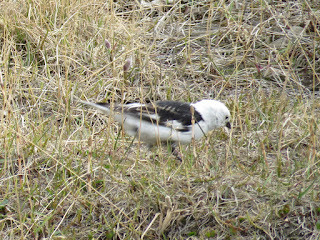 The only songbird is the snow bunting, which we enjoyed seeing in its white breeding plumage. 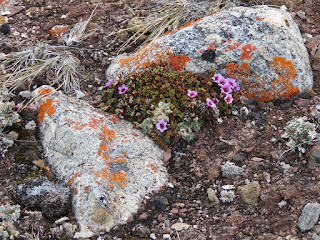 Small spring flowers bloomed in the vegetation we saw, especially purple saxifrage, which creates a pink carpet in some places. One species of willow, a relative of the full-sized tree, grows to just a few inches high. 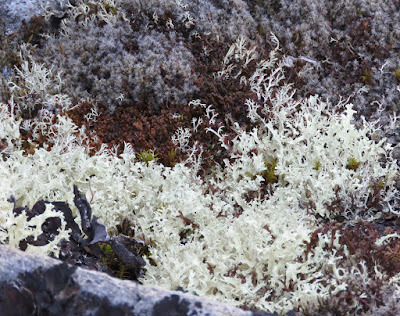 I never think of moss or lichen as being white. 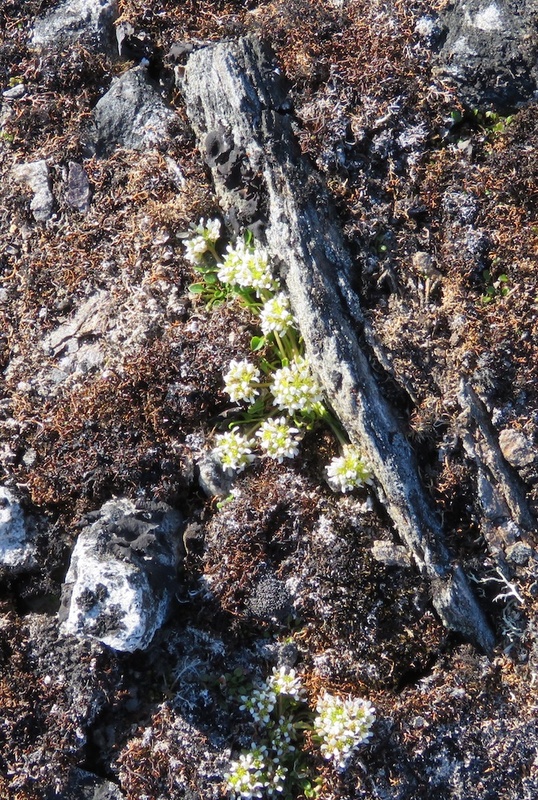 And it would be interesting walking on the tundra -- just the texture if nothing else -- and there is plenty else!